This dish gets its name from the way it’s traditionally cooked. The Arabic word “shawarma” comes from a Turkish word that means “turning”. For shawarma, meat is placed on a spit and grilled, sometimes for over a day. In this recipe, we’re using ground chicken and browning it with a blend of 6 spices. In addition to saving time, this method makes sure every bite is evenly seasoned, tender and delicious! Preheat the oven to 425°F. Wash and dry the fresh produce. Heat a small pot of salted water to boiling on high. Peel and mince the garlic, then, using the flat side of your knife, smash until it resembles a paste. Finely chop the dill. Using a peeler, remove the yellow rind of the lemon, avoiding the white pith; mince the rind to get 2 teaspoons of lemon zest. Quarter the lemon and remove the seeds. Small dice the cucumber. Peel and thinly slice the onion. Peel and mince the shallot and place in a medium bowl with the red wine vinegar. 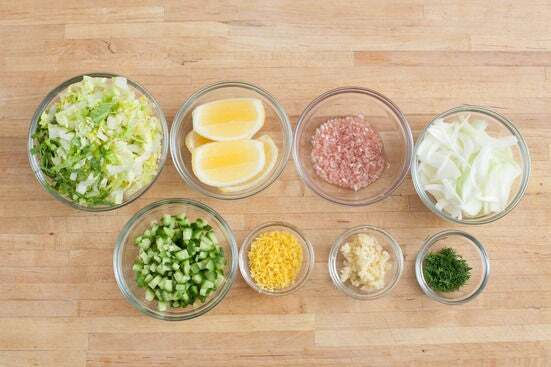 Thinly slice the lettuce. Once the water is boiling, add the beets and cook 25 to 28 minutes, or until tender when pierced with a fork. Drain thoroughly. 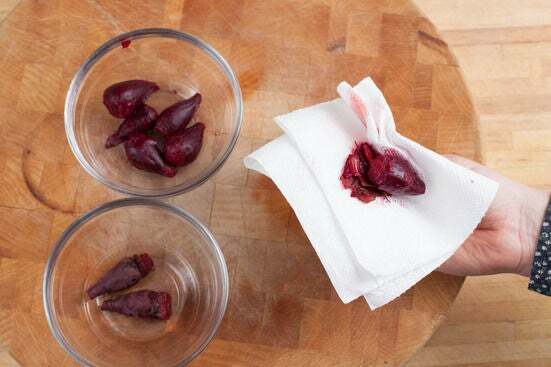 Using a paper towel, gently rub the skins off of the beets. Discard the skins and slice each beet in half lengthwise. Toss with the shallot-vinegar mixture and 2 teaspoons olive oil; season with salt and pepper to taste. 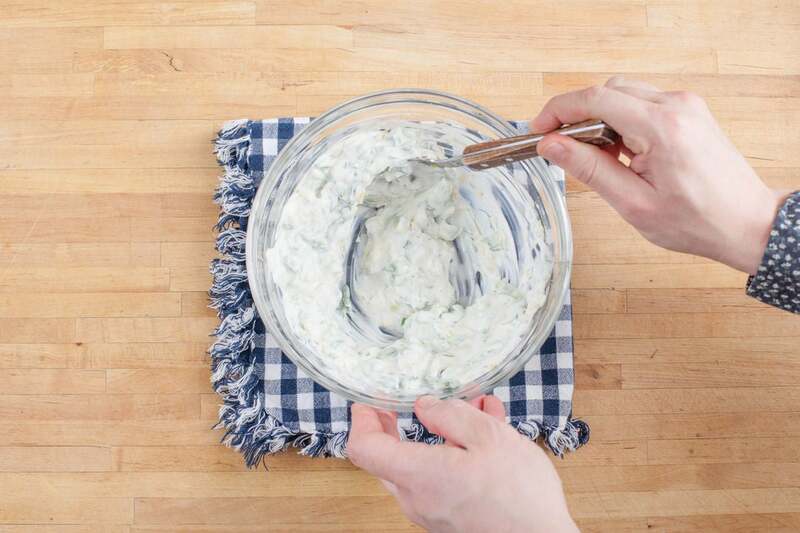 In a small bowl, combine the Greek yogurt, lemon zest, dill, cucumber, half of the garlic paste (save the rest for the vegetables) and the juice of 2 lemon wedges. Season with salt and pepper and cover. Place in the refrigerator while you finish cooking. In a large pan, heat 2 teaspoons of olive oil on medium-high until hot. 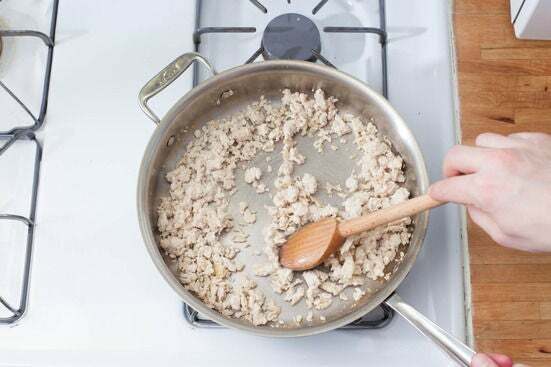 Add the ground chicken and season with salt and pepper. Cook 2 to 3 minutes, or until mostly cooked through, frequently breaking apart the meat with a spoon. Add the onion, Shawarma spice blend and remaining garlic to the pan of chicken. (If the pan is dry, add another teaspoon of olive oil.) 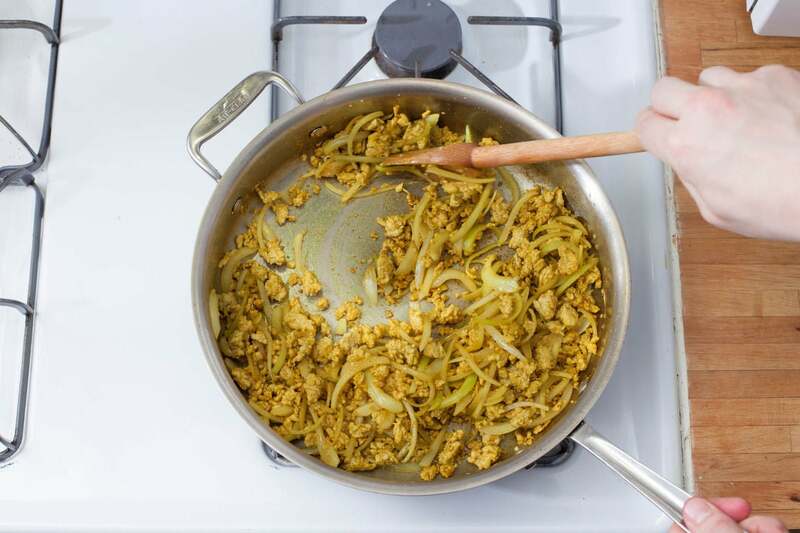 Cook, stirring frequently, 3 to 5 minutes, or until the chicken is browned and cooked through and the vegetables are softened. Using tongs, place the pitas directly on the oven rack and toast for 3 to 4 minutes, or until warmed and toasted. Remove from oven. 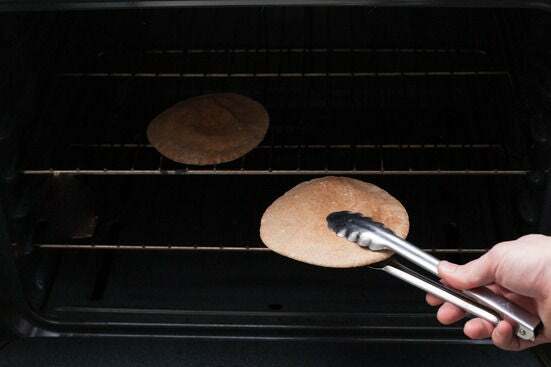 When cool enough to handle, cut each pita in half (into half circles). 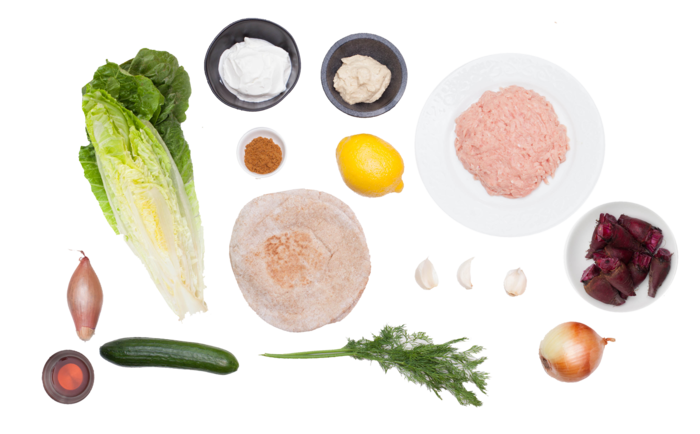 To plate your dish, spread ¼ of the hummus inside each pita half and fill with the chicken-vegetable mixture and lettuce. Spoon some of the tzatziki sauce into each pita. 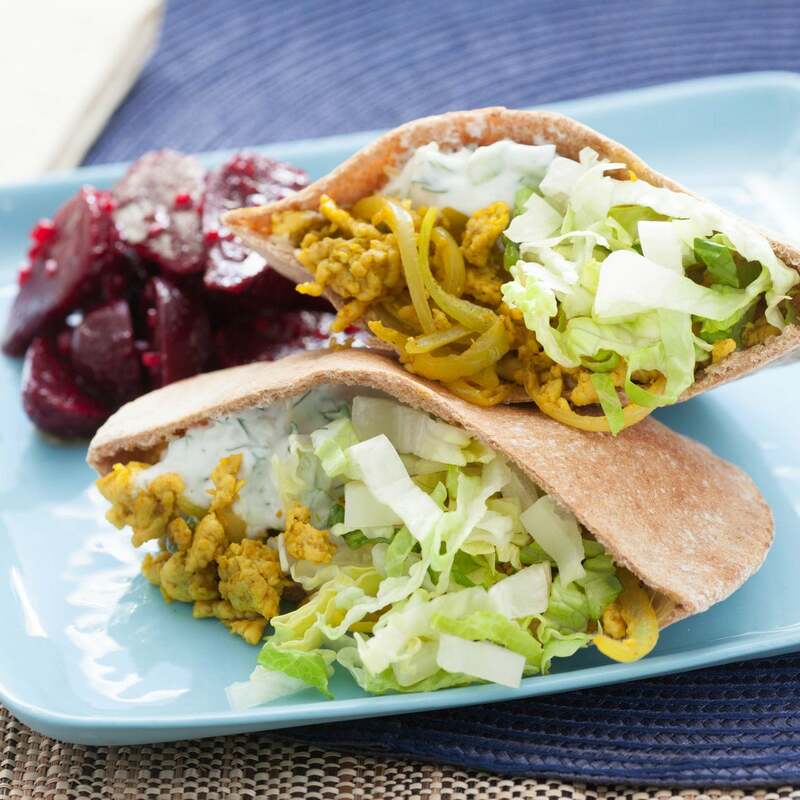 Divide the pitas between 2 plates and serve with the beet salad on the side. Garnish with the remaining lemon wedges. Enjoy!